If you haven't fished before, you don't know what you're missing. If you did, you would be a fisherperson. Not only does it bring you closer to nature, there's the thrill of the catch. Imagine standing on the bank of a stream on a beautiful day, your rod bending under the weight of a good catch. This one's a fighter and you take your time, allowing the fish to tire itself out before reeling it to shore. When you finally land it, you realize you've just caught the biggest fish of your life. It's a great feeling and 1 you'll never know until you give fishing a try. * Check your local conservation or wildlife service -- they often hold a fishing day where beginners can learn the basics of fishing. * If you go on vacation in fishing country (which is darn near anywhere), check with local fishing stores -- they often know local professionals who will teach you how to fish. Anytime is a good time to fish; you never know what you might catch. Some species are more active near dawn and dusk when they are feeding, while others will bite any time of the day. Certain times of the year are best for certain species. Fishing is a pastime you can enjoy all year round. Fishing licenses are required in most places, which you can buy at fishing tackle stores or Conservation and Wildlife Centers. The cost varies by location. Licenses for children are usually not required. 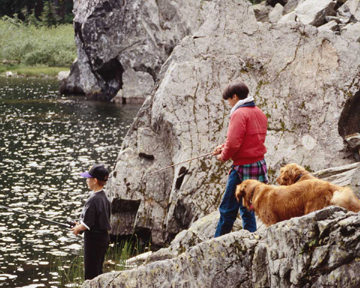 If you want to fish on private property, be sure to get permission from the owner. Otherwise it is trespassing. If you've read this far, it may be a sign you're getting interested in fishing. Just follow the above instructions and soon you will be enjoying your favorite new hobby.